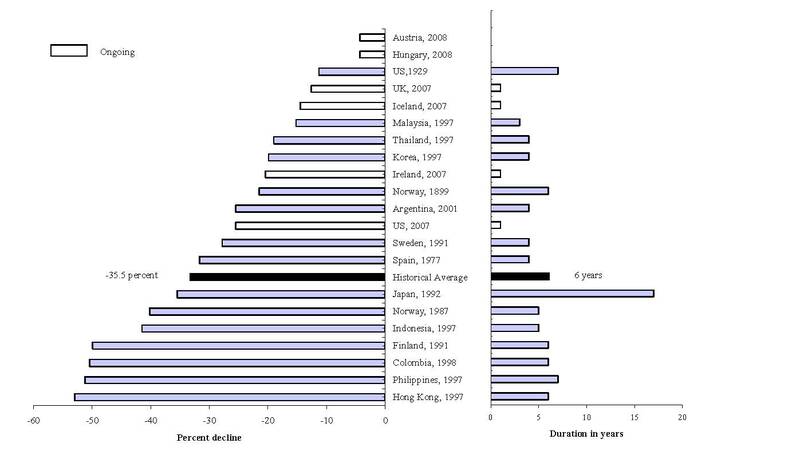 NewObservations.net projects residential real estate prices will fall 12 percent nationwide in 2010. Our average of four major indexes predicts a total fall in prices of 34% from peak to stable trend. The total fall of 34% is based upon a current loss across four number sets of 19%. The timing and the total fall vary widely among the data. The most conservative picture of our total fall is a 20% loss. The most radical prediction is that values will fall 51% from peak to stable trend (Please see the summary of results immediately below.). One data set predicts that we will attain a trend value this year and then push beyond it (See below the First American Core Logic Chart.). The projections provided here artificially limit the loss to a return-to-trend value. Two conservative data sets see the fall in values continuing through the summer of 2013. If correct, that’s equal to 3.5 more years of falling prices. 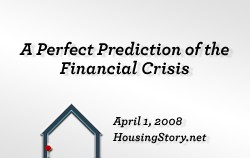 The leading economic historians say prices normally fall for six years after a credit bubble. Based upon a summer 2006 high, the middle of 2012 is the projected bottom (Please see the chart below from CARMEN M. REINHART and KENNETH S. ROGOFF.). All of the forecasts here are based upon the author’s assumption that real estate is a stable investment which largely tracks inflation. 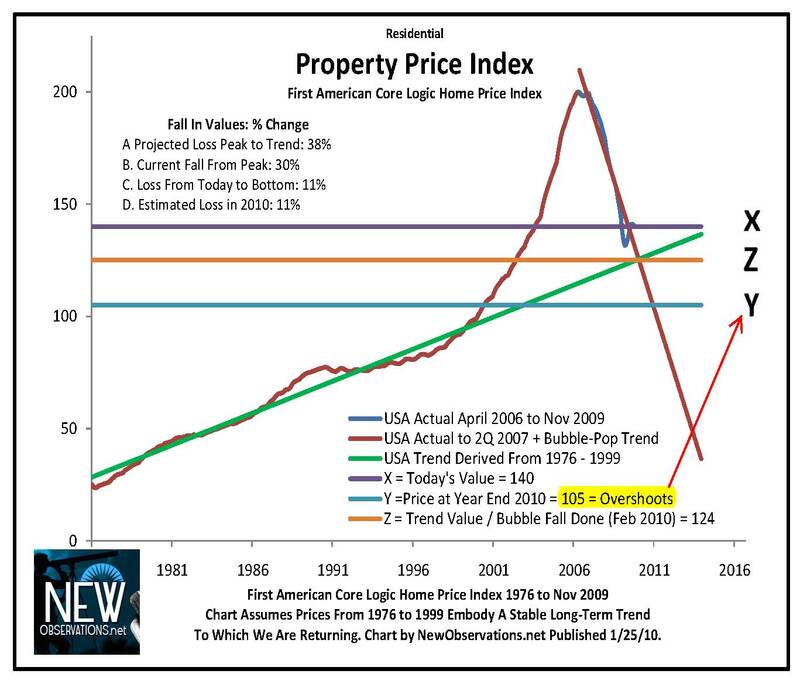 The follow-on assumption is that values broke out of this stable pricing pattern in a real estate bubble which started in 1990. The basis of the primary assumption, the assumption that real estate is a stable non-appreciating asset, is taken directly from Robert Shiller. He is a leading expert on real estate prices. “My data show that between 1890 and 1990 real home prices actually didn’t increase,” Mr. Shiller wrote in Newsweek (Dec 30, 2009), Why We’ll Always Have More Money Than Sense. If prices didn’t appreciate for 100 years, it leads one to assume the break in that pattern is an artificial break. The prediction of a 12% fall this year averages forecasts ranging as high as 28% and as low as 4%. I try to make no judgment about these estimates. I report the numbers objectively based upon providing a linear projection of the fall in prices dating from the market peak. Each data set is treated the same way. If the upward trend starting in 1990 is supportable and real, then the numbers provided here are very likely to be incorrect. If government policies reenact a bubble, these numbers will also be incorrect. The federal government has taken extraordinary measures to stop the fall predicted by these trend charts. Given the massive power of the United States Treasury and the Federal Reserve, those efforts may win. Their steps to artificially maintain prices center on Fannie Mae, Freddie Mac, and the FHA making essentially every new mortgage loan in the United States today. Without their lending, real estate prices in the United States would fall dramatically. The author estimates prices would fall 50% to 75% from today’s level if Fannie, Freddie, and the FHA stopped making loans. Private investment in mortgage loans has disappeared. 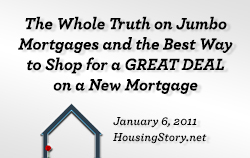 Without government lending most purchases would have to be made from the buyer’s savings. Buyers would have to pay all cash. It’s a way of doing things we don’t even understand. 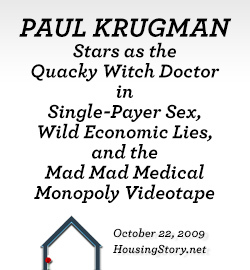 We are in a radical real estate depression hidden from us by massive government fixes. 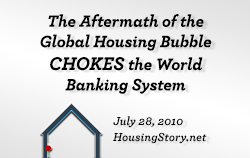 The housing bubble was created in a classic credit mania which artificially lifted the prices of all assets which could be purchased with borrowed money. Credit manias are common in human history. Normally time has to pass for the memory of the irrationality to fade and to be allowed a new place to resume. In our case we may have simply re-fired the credit-mania stove immediately and we are now in and marching toward new mania bubbles with new defaults and larger crises. 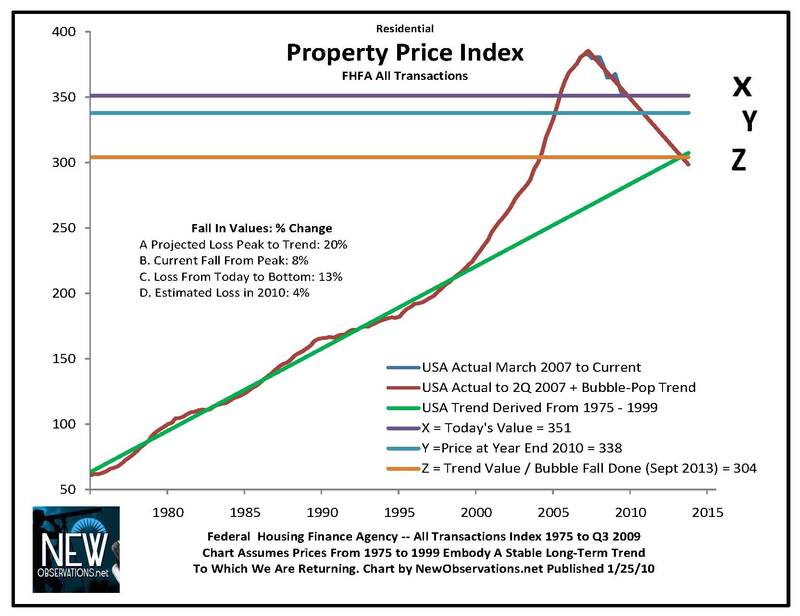 Residential real estate is probably the most consequential of all the bubble assets from our current crisis. Mortgages were the largest financial asset category of the last bubble with a total issued at the top of about $12 trillion. Real estate is of primary importance to any family’s finances when they own the home that they live in. Consumers have been hit with falling prices since as early as June 2006. The numbers show current national losses of between 8% and 30%. This summer we will reach the fourth year of a general trend of falling real estate prices. Against that trend values have increased in the last two quarters. All of the forecasts made here include those recent increasing values in the projection of future losses. The recent positive increases in value were not enough to counteract serious and sometimes extreme losses in value over the last 3.5 years. The government has made an enormous assumption in crafting its policy on housing: It assumes that maintaining values is of the utmost importance. It’s a tragic mistake. 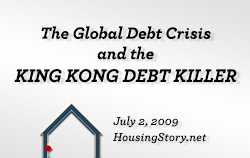 The proper way to manage a credit bubble is to destroy errant debt issued beyond the capacity of the borrower. 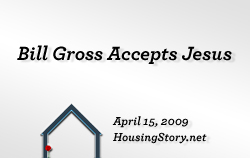 This means that some subset of all mortgage debt issued after 1990 is invalid. It’s a fiction and a fantasy. It is a dead-weight loss issued to fools who believed in real estate as an investment. 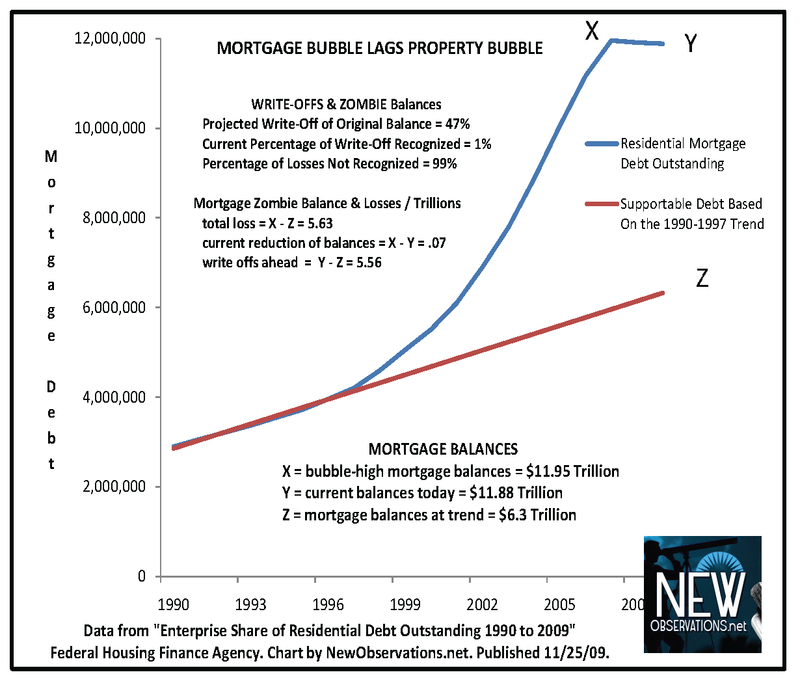 In a November 2009 report I estimated total excessive mortgage issuance of $5 trillion — Losses and Zombie Debt in Residential Mortgages Surpass $5 trillion (See the chart above.). Given that the most essential element of our competitiveness is based upon the cost of labor, and given that the price of housing is our most expensive cost of living, we cannot live well, compete in the global marketplace, and pay for bubble-priced real estate all at the same time. We have to make a very difficult decision. The most provocative of all of the charts which I have been studying in the last six months suggests the fall is inevitable. 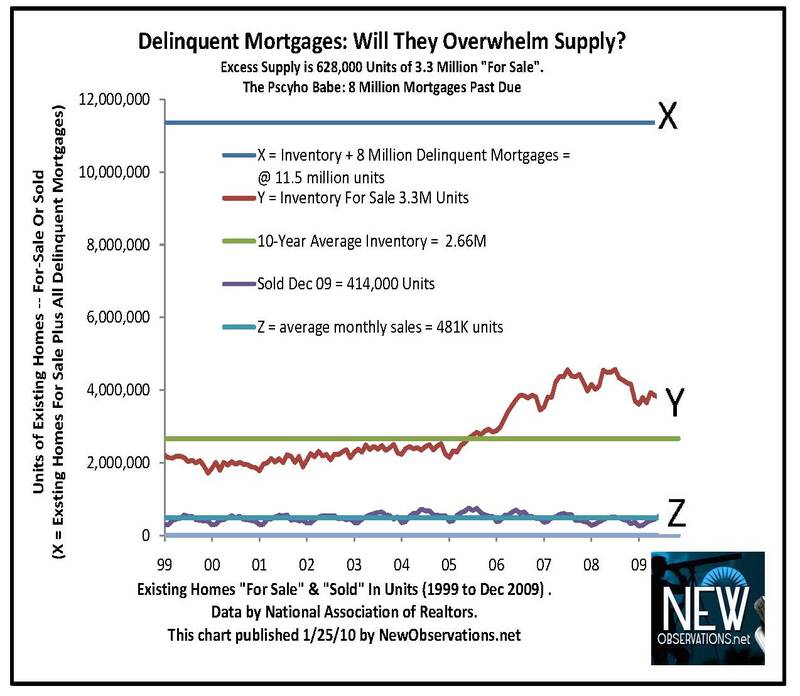 All of the government maneuvers will fail because delinquent first mortgages are now equal in number to three times a balanced for-sale inventory (Please see above “Delinquent Mortgages: Will They Overwhelm Supply?”). My prediction is that the leaders at our Treasury and the Fed will finish as the bigger or the biggest fools. They are waging nuclear war to maintain bubble pricing on 129 million housing units (If you are like me, you say that sentence, and you know that the policy is dead wrong.). Only an academic bureaucrat could make such a choice and believe in it. And the financial press has not even one word to say against this lunatic fantasy. The blind cover the dumb and vice versa. Ben Bernanke and Timothy Geithner prove that book learning makes you dumb and government work makes you slow. Don’t put your faith in them or their experience. They haven’t spent enough time in the real world. If you own real estate and you can sell, sell it. If you want to buy, make sure you are staying for 10 years and insist on a great deal. Make sure you can live with losing 10 percent or 20 percent or 30 percent of the price that you pay for your home. The risk inherent in our current real estate market is far beyond the tolerance of 98% of would-be buyers. That means you. You can get screwed badly if you buy now. Don’t do it. Don’t put yourself in the poor house. Phenomenal work — I’ve been forwarding it around. Very compelling argument, Michael. My wife and I am currently renting in White Plains, NY. It is still a hot market that has fallen only 5-10% since the peak. The rents are exhorbitant as well. Very tempting to buy given our rent, but I think we’ll wait till the government incentives (FHA, tax credit, low rates) change, so we get a more sane price. Any thoughts on Freddie and Frannie going down the tubes? Is it a matter or whether or when? 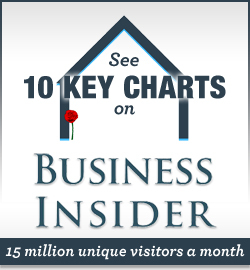 I’m new to your site and thinking but resonated solidly with your assertions. We sold near the top, rented for two years and then bought smaller in mid ’09 at 40% off. I’m now told that with our improvements our home is up 6 figures in 8 months (Austin TX). I sense that new “value” could evaporate rather quickly. Jobs and purchasing power are my big concerns. Incredible numbers of workers are getting short work-weeks and pay cuts of 10 – 20% are becoming quite routine. I only see debt driven deflation at work. With baby boomers downsizing and wages stagnant or falling I’m not sure who will be buying all the 4,000+ s.f. homes. Jumbo money rates have already compressed values here. 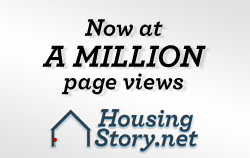 Yesterdays 600K and 800K homes are both the new 500K just because of the need to get the price to fit conforming money. Do you see special dangers in the large home market? Have you written about suburban vs. rural trends and values? Stunning charts and great work. I linked back to this post as it is an important read. Thank you. The data from the charts you posted are averaged from . . . which cities? Same sample set as Case Shiller? I’m particularly interested in the estimates – and your thoughts – on the Dallas market. Do the different data sets use the same city data? 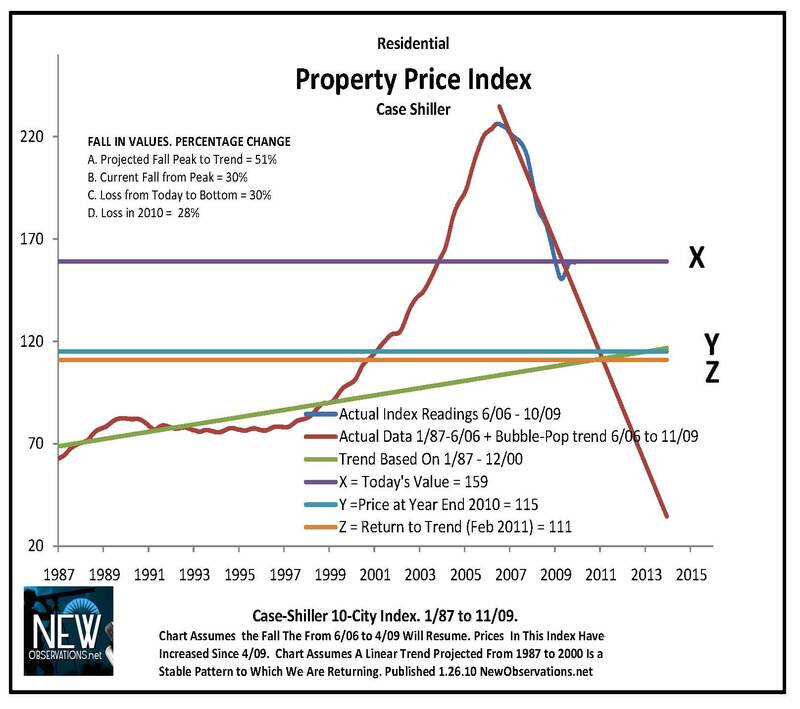 Not sure if Case Shiller’s city list is “industry standard” or if there is much variation across the indices. Hello Jr. No data set is the same. 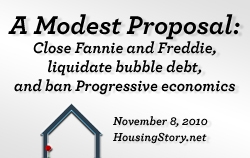 FHFA and Freddie start the same, but have their own method. I think of them as four different number sets with four different methods. Making a composite probably breaks the rules a mathematician would use. Thanks for your comment. 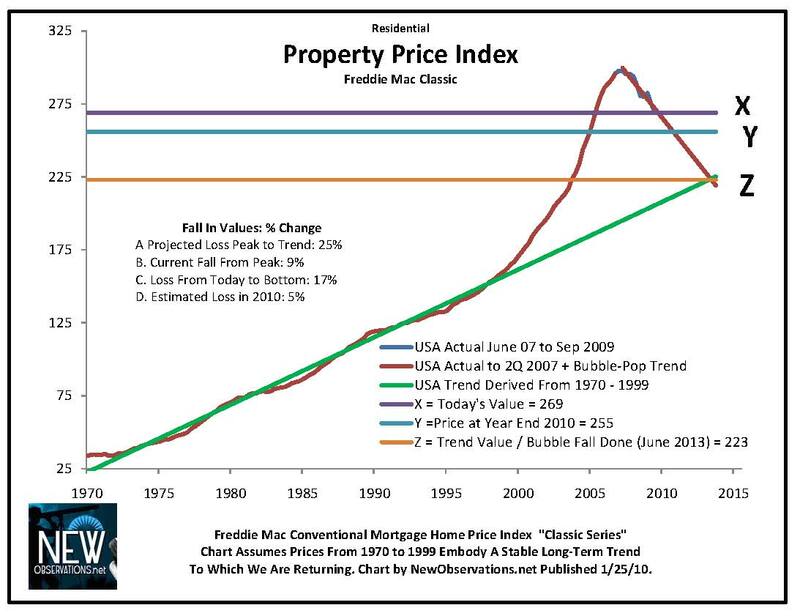 If there is large inflation and/or hyper-inflation, then real estate (real) prices will go up! Much better than keeping cash. Any comments? Since you address your advice to individuals, they should realize that real estate markets are local, not national. Your results may vary. For example, our building boom here in Stockton, CA was based on 2-hour drives each way to higher paying jobs. It is unlikely that house prices will ever rise again as fast as gasoline does. Once thing to keep in mind about falling home prices, these are median numbers. If you own a home that is at the lower end of the market, like 2.5 average times income, your home will probably not fall much if any in value. The big drop is in the upper end of the market, so those people who bought mcmansions cannot find move up buyers anymore, or those with bogus income stats. So, good news for those that own low priced homes. Bad news for those owning homes that cost more than 2.5 a person’s average yearly income. The problem is, most areas don’t have homes that are 2.5x average incomes. At least not where I live (outside of Philly). Try living in california ! WE’RE ONLY HALF WAY TO THE BOTTOM ! I agree that without extreme government intervention the collapse would have been substantially more cataclysmic. I’d sell in a heartbeat if I did not think the government would hold nothing back and print money till we all drown in order to keep home values from falling to where they should be, particularly in prime areas. My concern is inflation and if I sell, my plan to swoop back in in 2013-2014 could be ruined by government intervention and I’ll be locked out of the beach neighborhood I currently live in. Even with the profits, the tax levels at these prices would be unaffordable for me in the long run. Losing my current low tax burden under proposition 13 in California is big part of the calculation. I took the money and ran in mid 2004 and am now “locked out” unless I fork over additional money. To buy an identical house as I sold in the same neighborhood (that is where I want to buy today) I would have to pay about 100K more and my property tax basis would now be 800K instead of 289K. There are other ways to take advantage of this situation but doing what I did was one of the more stupid things I did. It was a perfectly logical decision I just had no idea to the lengths my government would go to screw the prudent and reward stupidity. My sister feel’s your pain. They waited to buy and even now it is more expensive. I wish I had purchased some land or bought a bigger house when I did. Prices are still high versus people’s income. The banks want to enslave us forever. When talking about the federal govt and the banking systems its just a slightly milder version of the Cash Advance business.